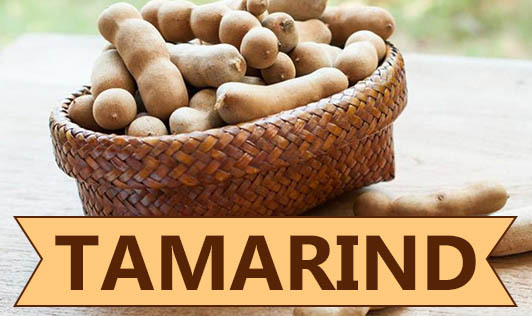 Tamarind or imli is the fruit of the plant Tamarindus indica. The fruit is a brown pod-like legume that contains a soft pulp and many hard, coated seeds. The fruit pulp is edible and popular and used as a spice both in Asian as well as in Latin American cuisine. The pulp of the young fruit is very sour and extensively used in cooking for imparting sour taste. The ripened fruit is sweeter and can be used in desserts, drinks, or as snacks. The fully ripe fresh fruit is relished out-of-hand by children and adults, alike. From a nutrition point of view, tamarind pulp is a significant source of fibre and iron. Tamarind is a main ingredient in South Indian preparations such as sambhar, rasam, curries, puliogare, and various kinds of chutneys. It is also an important ingredient of Worcestershire sauce and in a special Indian seafood pickle called "tamarind fish". It is sold as a candy in Mexico and in various snack forms in Southeast Asia. Tamarind ale has long been a popular drink in the tropics. Tamarind pulp can be made into a tart jelly and tamarind jam is produced commercially in a few countries. While making fruit preserves, tamarind is sometimes combined with guava, papaya, or banana. Tamarind juice concentrate and dehydrated tamarind powder are available in the market and these can be easily dissolved in hot water and used in culinary preparations. Due to its medicinal value, tamarind is also used in ayurvedic medicine for treating gastric and digestive problems.